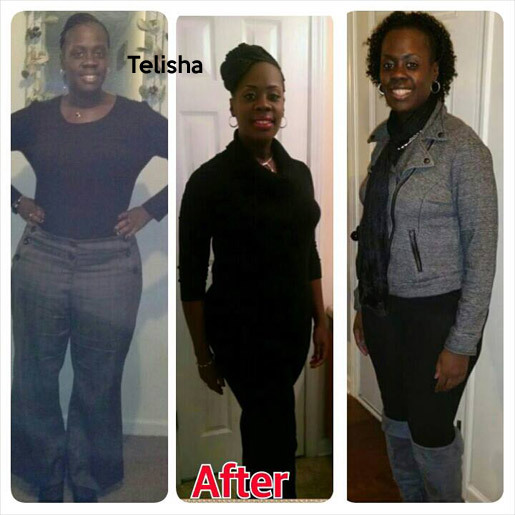 Update – March 2015: Telisha wrote in recently to let us know that she’s lost another 38 pounds for a total of 100 pounds gone! Hello, I am just writing to give you an update. I am still on my weight loss journey and I have lost a total of 100lbs and holding. I have reached a plateau but it hasn’t discouraged me from continuing to try to get these last 30 lbs off. I am now 180lbs and I am loving it!!! My name is Telisha Kendall. 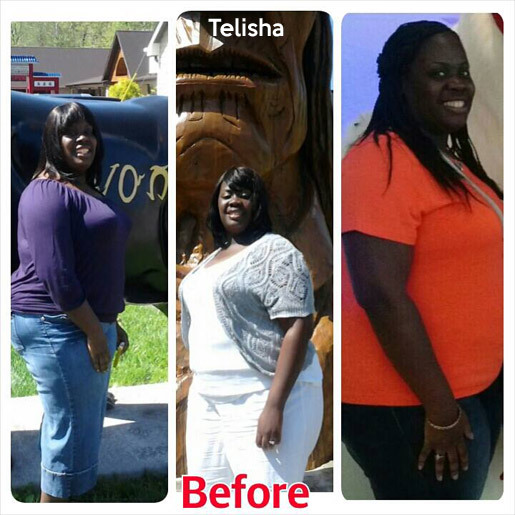 I started my weight loss journey 6/28/2014. I’m 3 months in and have lost 62 pounds so far. I have a 100 pound goal for now. I started at 280 lbs and I am now 218 lbs (5’4″). On June 27, 2014 I got on the scale and saw I was 280 lbs. I got off and stepped back on and it said 281 lbs. All I could think was that I was 20 lbs away from 300 pounds and that was embarrassing to me. I made up in my mind I was going to lose weight. My motivation: I am single parent of a 12 year old son. I want to be around to raise him. Although I had no illnesses due to being overweight, weight related illnesses run in my family. It was a matter of time before I would have high blood pressure or diabetes. I wanted to ensure that my health would keep me around for him. I just wanted to be able to enjoy life. My weight kept me from being able to ride amusement park rides or walk for long periods of time without my ankles throbbing. 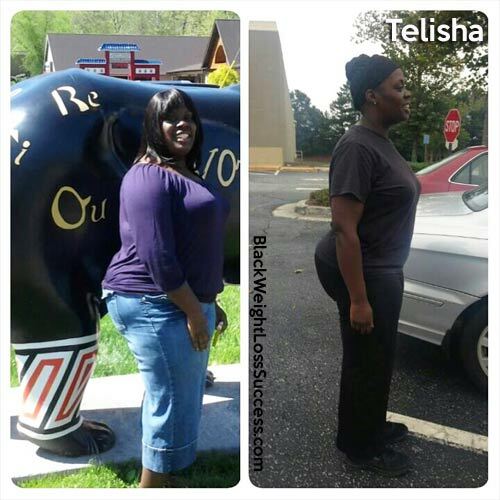 Changing my eating habits: I went cold turkey on everything! I eliminated all sweets and soda from my diet. I eat minimal carbs and I eat meat one day a week. I had to find protein in beans, greek yogurt and eggs. I eat 1100-1200 calories a day. Yes, I keep an accurate count of everything I eat. I pack snacks if I know that I will be very busy and need to eat something until my next meal. I also don’t eat after 5pm. Exercise routine: I workout 3 hours daily. I workout 7 days a week. I wake up on weekdays at 4am and do an aerobics DVD. I then go to work and after work (4pm) I go to the gym for an hour. At 6:30pm, I jog 3 miles. I used to only be able to walk but now I can jog it. On the weekends I jog in the morning, then go to the gym and jog again in the evening. Advice: The best advice I can give is that “You can do it!” I want people to know that if you put God first and allow him to guide you it is possible. I also believe that you have to have your mind made up to lose weight. Until “I” was ready it wasn’t going to work for me. People say it’s okay to have cheat days but I rarely ever cheat. I am too focused to allow myself to slip but if you do just immediately begin over again. I am still on my journey but I am grateful for the progress that I have made thus far. In 3 months I lost 62 lbs and I have 38 lbs more to lose. I am a winner! Yes you are a Winner! You are definitely a winner, and you can do it and will do it. Stay focused and keep up the good work. God Bless. Amen to that my sista!!! CONGRATS! You’re AMAZING, and you look WONDERFUL! Thanks for all your details on how you are losing the weight. A winner indeed!!! AWESOMESAUCE! I’m in the same fight currently! I’m learning new things constantly,applying to my journey to make the lifelong change. I applaud you! Congrats! That’s the motivation I needed to hear. Also, you look like someone I went to school with years ago, are you from NC by any chance?